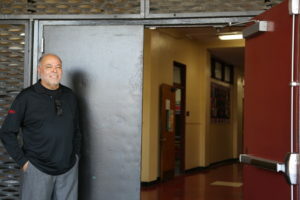 Richard Monteilh is the Vice Principal at St. Odilia School, one of the Food Bank’s partner agencies. The school participates in multiple Food Bank programs, including the Children’s Breakfast Program, which is funded by Hunger Is, a Joint Charitable Initiative of the Albertsons Companies Foundation and the Entertainment Industry Foundation. The program is designed to build awareness and raise funds in an effort to eradicate childhood hunger in America. Funds raised through Hunger Is directly benefit programs focused on combating childhood hunger and improving health-related outcomes. Because of this funding, the Los Angeles Regional Food Bank is able to provide nutritious breakfast kits, which include items like fresh fruit, cereal and milk to children living in food-insecure homes in Los Angeles County. Monteilh says his community has become more stable over the years, but that there are still many obstacles when it comes to nutrition. All of St. Odilia’s students qualify for free or reduced-price lunch, so the need at the school is great. The Children’s Breakfast Program currently serves 2,055 children at 24 sites, providing vital resources that children need to grow, play, learn and thrive. “Thank you, thank you, thank you. That’s all we can say!” says Monteilh.